The second development project between Wright, Runstad & Company and King County, the project goal from the start was to build a LEED™ Silver class “A” office space. With King County posed to take a major portion of the new building, the expectation of the tenant was known and the design moved quickly. As with most projects in the City of Seattle a specific amount of the construction costs are set aside for art. 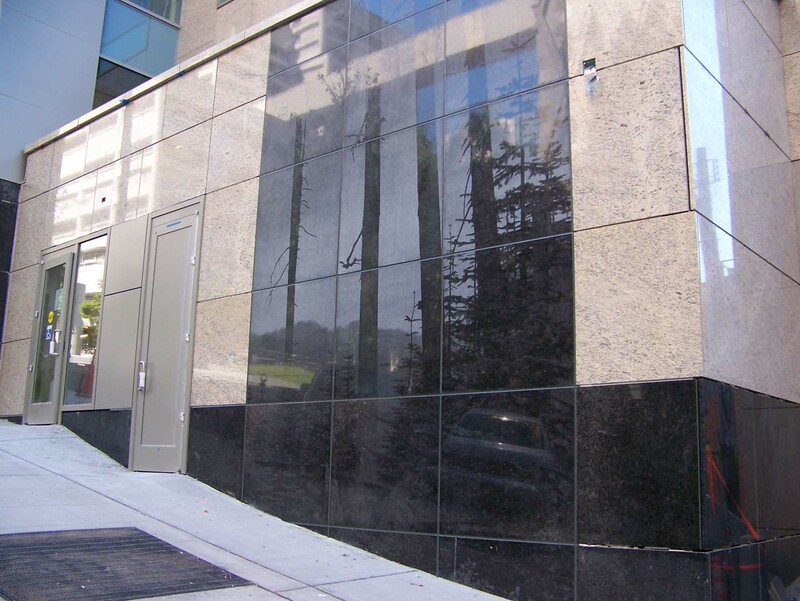 In the case of the Goat Hill project the art was photographic etching of black granite. A local artist and photographer completed this process and when observing the individual pieces of stone it is very hard to see the photograph. However, once the artist stone was installed it became very easy to see the subtle changes and shading on the face of the stone that the transferred photograph had made. The final building design includes 300,000 square feet of office space, ground floor lease spaces and a two story below grade parking garage. The entire exterior of the building would include stone cladding and glass. The exterior of the tower is clad in low “E” glazing, metal panel and stone in a unitized system. The building site offers some of the best unobstructed views in Downtown Seattle, large openings of glass were utilized to take in all of the views. The final stone design called for exterior stone cladding that also included the artist stone. The interior lobby included wall cladding, stone base, elevator cabs, reception desk and paving throughout. Working with the artist scope proved to be very challenging and required a great deal of coordination to ensure the right pieces were utilized in the right orientation. The reproduction of the photographs included as many as thirty pieces of stone to complete a single photo. When the installation of the artist stone was completed it was easy to see the complete photo and appreciate the artistry.